A French policeman who fatally shot a black man during a brawl with officers has been charged with manslaughter. The man's death has led to an outbreak of violence, with riots extending into their fourth day on Saturday. Tensions continue to run high in Nantes, a city in western France where a 22-year-old man, identified as Aboubakar Fofana, was shot dead by a police officer as he was resisting arrest on Tuesday. Fofana received a lethal injury to his neck and bled out before medics arrived after his car was pulled over by officers for an inspection. The young man, who was suspected of being involved in drug trafficking, reportedly did not carry an ID and gave the police a false name, prompting them to apprehend him. As he refused to surrender, an altercation ensued. At some point, a police officer standing nearby intervened, gunning the suspect down. 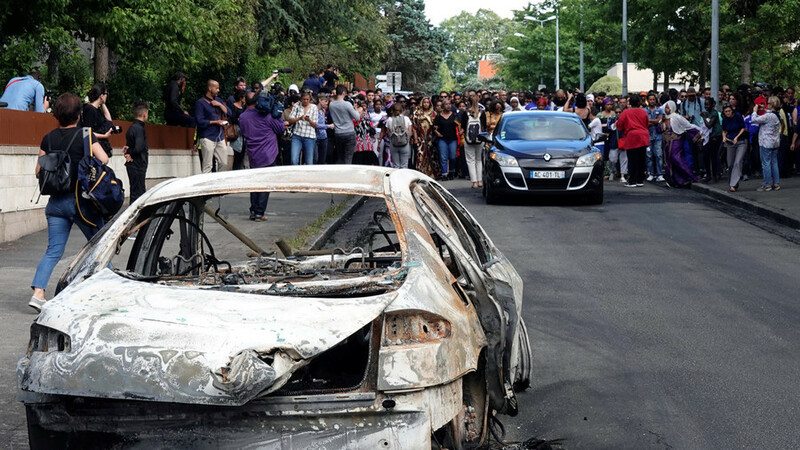 The incident has sparked a wave of unrest, which has swept through mostly impoverished and immigrant-heavy neighborhoods of the city, as well as Fofana's native Paris suburb of Garges-les-Gonesse. Some 1,000 protesters descended on Nantes on Thursday, chanting "justice for Abou." The crowd set 52 cars ablaze, including the city mayor's, and vandalized several buildings, setting fire to a shopping center, a library and a police station. In a bid to quell the violence, police deployed tear gas. The police officer initially insisted that he was acting in self-defense when he fired at the suspect. However, he then changed his tune, saying that the shot was "accidental." On Saturday morning, the lawyer for the officer told media his client has been charged with manslaughter, AFP reported. However, the fact that formal charges have been brought against the policeman did not deter the protesters from further violence, which continued into the fourth day, with several more cars being burned on Saturday morning. French authorities have made several attempts to placate the violence amid fears that it may spill over to other regions. French Prime Minister Edouard Philippe appealed to the disgruntled youth during his visit to Nantes on Thursday, promising "the fullest transparency" during the investigation of Fofana's death.